People with MS typically experience one of four disease courses. There are over a dozen treatments to help modify the MS disease process. 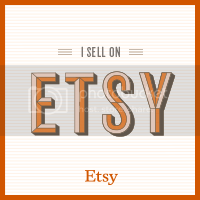 Myelin – the protective coating around nerve fibers in the central nervous system – is a primary target of the immune attack in MS.
CIS is a first episode of neurologic symptoms caused by inflammation and demyelination in the central nervous system. The episode, which by definition must last for at least 24 hours, is characteristic of multiple sclerosis but does not yet meet the criteria for a diagnosis of MSbecause people who experience a CIS may or may not go on to develop MS. When CIS is accompanied by lesions on a brain MRI (magnetic resonance imaging) that are similar to those seen in MS, the person has a high likelihood of a second episode of neurologic symptoms and diagnosis of relapsing-remitting MS. When CIS is not accompanied by MS-like lesions on a brain MRI, the person has a much lower likelihood of developing MS. The 2017 diagnostic criteria for MS make it possible to diagnose MS in a person with CIS who also has specific findings on brain MRI that provide evidence of an earlier episode of damage in a different location and indicate active inflammation in a region other than the one causing the current symptoms. As MRI technology improves, the diagnosis of MS will be made more quickly and easily. In the meantime, individuals with CIS who are considered at high risk for developing MS may now be treated with a disease-modifying therapy that has been approved by the U.S. Food and Drug Administration (FDA) for that purpose. Early treatment of CIS has been shown to delay onset of MS.
RRMS – the most common disease course – is characterized by clearly defined attacks of new or increasing neurologic symptoms. These attacks – also called relapses or exacerbations – are followed by periods of partial or complete recovery (remissions). During remissions, all symptoms may disappear, or some symptoms may continue and become permanent. However, there is no apparent progression of the disease during the periods of remission. 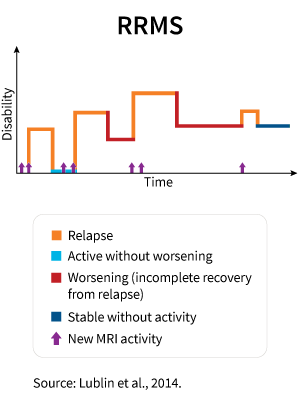 At different points in time, RRMS can be further characterized as either active (with relapses and/or evidence of new MRI activity) or not active, as well as worsening (a confirmed increase in disability over a specified period of time following a relapse) or not worsening. 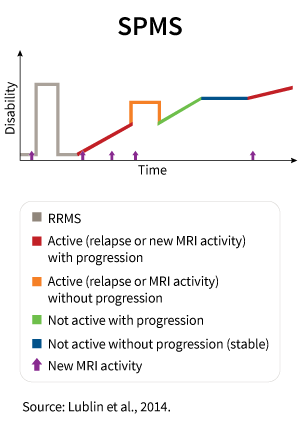 This graphic shows the kinds of disease activity that can occur in RRMS over time; however each person’s experience with RRMS will be unique. Following a relapse, the new symptoms may disappear without causing any increase in level of disability, or the new symptoms may partially disappear, resulting in an increase in disability. New lesions on MRI, as shown by the arrows, often occur as part of a relapse. However, new MRI lesions indicating MS activity may also occur without symptoms of which the person is aware. SPMS follows an initial relapsing-remitting course. Most people who are diagnosed with RRMS will eventually transition to a secondary progressive course in which there is a progressive worsening of neurologic function (accumulation of disability) over time. SPMS can be further characterized at different points in time as either active (with relapses and/or evidence of new MRI activity) or not active, as well as with progression (evidence of disease worsening on an objective measure of change over time, with or without relapses) or without progression. This graphic shows the kinds of disease activity that can occur in SPMS over time; however each person’s experience with SPMS will be unique. SPMS follows after relapsing-remitting MS. Disability gradually increases over time, with or without evidence of disease activity (relapses or changes on MRI). In SPMS, occasional relapses may occur, as well as periods of stability. PPMS is characterized by worsening neurologic function (accumulation of disability) from the onset of symptoms, without early relapses or remissions. 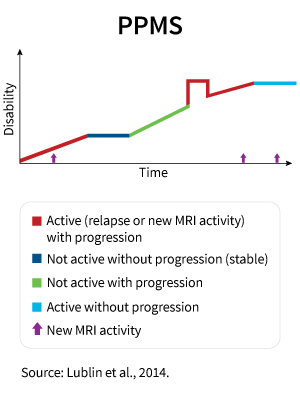 PPMS can be further characterized at different points in time as either active (with an occasional relapse and/or evidence of new MRI activity) or not active, as well as with progression (evidence of disease worsening on an objective measure of change over time, with or without relapse or new MRI activity) or without progression. Approximately 15 percent of people with MS are diagnosed with PPMS. This graphic shows the kinds of disease activity that can occur in PPMS over time; however each person’s experience with PPMS will be unique. PPMS can have brief periods when the disease is stable, with or without a relapse or new MRI activity, as well as periods when increasing disability occurs with or without new relapses or lesions on MRI. A variant of MS that needs to be understood. Click here for more information on this tragic from of the disease.